Prayer is a part of the Armor. It’s not just about having a conversation with God; it’s about allowing God to be a part of every moment of our lives. For those of us who have unknowns and pain there is a bigger picture of eternity where we can put our focus, knowing that we will all receive praise at the Judgment Seat of Christ. No matter what happens, God can take what is meant for evil and turn it around for our good when we allow God, in prayer, to encourage us, sustain us, fulfill us, and to take each difficult step along the way. There was nothing Job did to deserve affliction. He did not displease God. He was not full of sin. He did not get angry with God during his affliction. Job did not base his relationship with God on the blessings he received. Let’s try to look at our situation, struggles, trials and tribulations from heaven’s perspective. It’s not easy to change our perspective while in the midst of a battle, but with prayer and renewing of our mind, God can help us to see the bigger picture. “Praying always with all prayer and supplication in the Spirit, and watching thereto with all perseverance and supplication for all saints” Ephesians 6:18. This week on Sharin’ Hearts Woman to Woman, Janie and Sharon wrap up the Armor of God with Prayer. The final part of the Armor is prayer; it is the “glue” that holds all the pieces in place. We need more than just head knowledge; we need to be able to apply prayer in our lives. Since we don’t wrestle against flesh and blood, prayers need to go up on our own behalf so that we don’t wrestle within our own selves. Take thoughts captive and renew our mind in His word. Discussing the “Seven Wonders of Prayer” we find some reminders of Gods greatness. 1. There is no promise too hard for God to fulfill. 2. There is no prayer too hard for God to answer. 3. There is no problem too hard for God to solve. 4. There is no place (town or city) too difficult for God to move and revive. 5. There is no heart too hard for God to break. 6. There is no season of time too hard for God to repeat. 7. There is no prophecy too hard for God to fulfill. Every prophecy has been given to us in a promise. “Above all, taking the shield of faith, wherewith you shall be able to quench all the fiery darts of the wicked. And take the helmet of salvation and the sword of the Spirit, which is the word of God” Ephesians 6:16-17. This week on Sharin’ Hearts Woman to Woman, Janie and Sharon continue their discussion on the Armor or God. This second part focuses on the shield of faith, the helmet of salvation, and the sword of the Spirit. Ephesians Chapters 1-3 tells what the character of Christ has done for us. Ephesians Chapters 4-5 shows us how we can tell if we are appropriating the character of Christ. Now, in Ephesians 6, to activate is simple: We are in Christ, He is our all in all, so the weapons of our warfare is not something we go pull out of a drawer, or obtain in our own strength; it’s putting on Him, it’s putting on life. Satan’s power was completely broken at Calvary and we are blessed with that breaking (Satan has no power over us) Romans 6:6. “Put on the whole armor of God that you may be able to stand against the wiles of the devil” Ephesians 6:11. 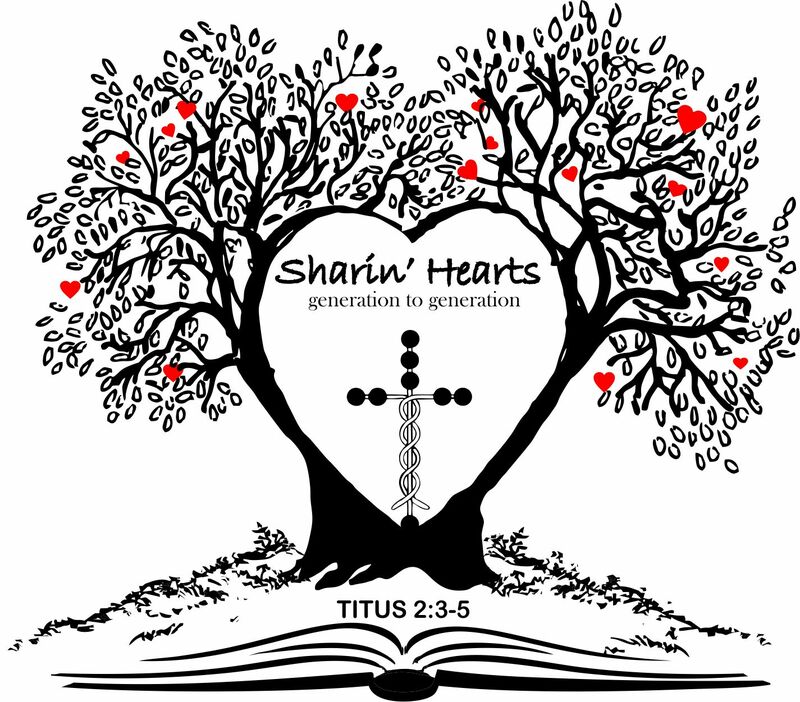 This week on Sharin’ Hearts Woman to Woman, Janie and Sharon expose some of the subtle ways the devil is tricking us. We don’t have to fall for his lies, we don’t have to surrender in defeat because we have access to the power of God and His armor is available to us; all we have to do is put on His armor and march forward in His power. We give the devil more credit than he deserves and too much say in our lives. We don’t have to sit in defeat and say “the devil has me down”! 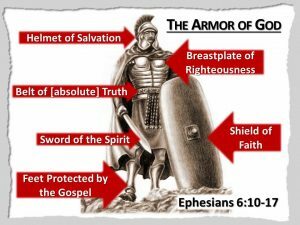 It’s time to get the Armor of God on and be the warriors we have been called to be. “Finally, my brethren, be strong in the Lord, and in the power of His might. Put on the whole armor of God, that you may be able to stand against the wiles of the devil” Ephesians 6:10-11. This week on Sharin’ Hearts Woman to Woman, Janie and Sharon continue their discussion on the Holy Spirit in Prayer and Warfare. No one likes the idea of war, but since we are in a battle, we need the power to fight and that power is of God. To have the power of God we need to know the precious promises, how to put on the Armor so we can withstand the wiles of the devil, and to know, reckon, and apply the work of the Cross for us and in us. Afflictions are no excuse for not being a Warrior for Jesus Christ. He gives us marching orders, but we don’t have to take those alone, in our own strength, we take them within the power of God, in His strength, and that’s how we can win the battle. Let’s stop surrendering to the enemy and giving him ground in our lives. Instead, let’s surrender to God and take back the ground that belongs to us and fight within the power of God. Let’s get our armor on, our weapon in hand, and march into battle prepared. The Wiles of the Enemy teaching handout. “For we wrestle not against flesh and blood, but against principalities, against powers, against the rulers of the darkness of this world, against spiritual wickedness in high places. Wherefore take to you the whole armor of God, that you may be able to withstand in the evil day, and having done all, to stand” Ephesians 6:12-13. This week on Sharin’ Hearts Woman to Woman, Janie and Sharon discuss the Holy Spirit in Prayer and Warfare. No one likes to go to war! There is a different level of awareness that is required in warfare situations that is not faced on the home front. Yet, if we really take a good hard look at our life we might find that we are surrounded by the enemy, and we’re taking on fire. We don’t know where to find cover or how to get our armor on. It seems easier to surrender in defeat and ask God why He allowed such an attack. Let’s think about customizing our Christianity to the specs God has given. Let’s get our armor on, our weapon in hand, and march into battle prepared. “But when the Comforter (Holy Spirit) is come whom I will send to you from the Father, even the Spirit of truth, which proceeds from the Father, He shall testify of Me” John 15:26. Today on Woman to Woman, Janie and Sharon discuss ways that the Holy Spirit bears witness. How quietness in prayer is a vital key to unlocking the power of the Holy Spirit to be active in our lives. The three “P’s” to praying effectually in the Name of Jesus (in His power and authority) are; praying with His Purpose, accept His Process, and trust in His Performance. Changing our prayer life will ultimately change our life. It’s time to stop asking for so many blessings and start asking for a few marching orders. Today on Woman to Woman, Janie and Sharon discuss the importance of the Holy Spirit in our lives. The Holy Spirit is in us to continue the work that Jesus began when He came. God the Father supplies our need, Jesus intercedes for us, and the Holy Spirit applies it in our life to be real. We are responsible for allowing the Holy Spirit to share with us the mind of Christ, cause us to bear witness of Christ, and prompt us to glorify God; just a few of the roles He plays in our Christian life. “Wide is the gate, and broad is the way that leads to destruction, and many there be which go in there at: because strait is the gate, and narrow is the way, which leads to life and few there be that find it” Matthew 7:13-14. “But the Comforter, which is the Holy Spirit, whom the Father will send in My name, He shall teach you all things, and bring all things to your remembrance, whatsoever I have said to you” John 14:26. Today on Woman to Woman, Janie and Sharon discuss how we can implement agape love. Since agape love is given by God, we can only give it if we have a relationship with Him through His Son, Jesus, by which we have received the Holy Spirit. The Holy Spirit is the topic in this challenging conversation. They talk about who the Holy Spirit is and the roles He plays in our lives. 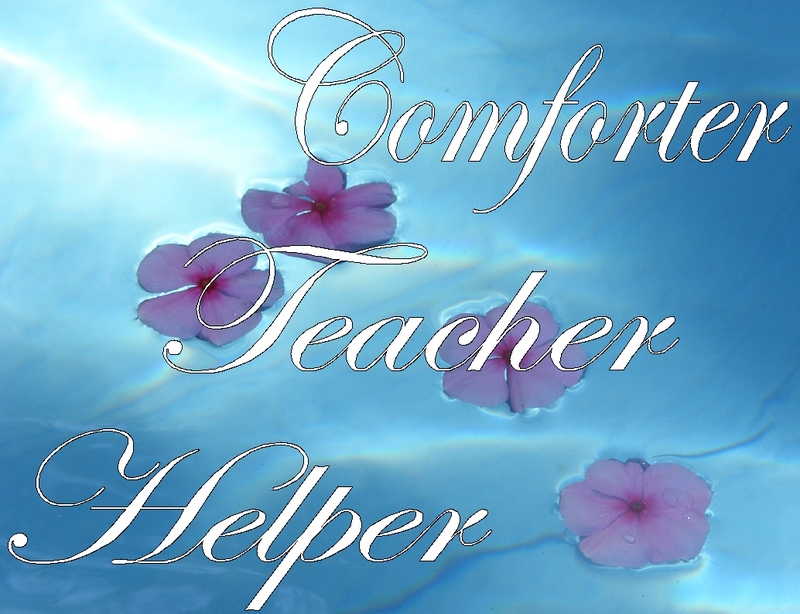 You will find a helpful guide for evaluating your walk in the teaching handouts. Flesh and Spirit comparison with scripture verses provided by His Truth Transforms Ministries. 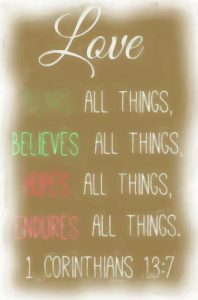 Today on Woman to Woman, Janie and Sharon finish up with 1 Corinthians 13 discussing agape love. Giving descriptive words to share what each characteristic would look like in practice so that we can recognize agape love or lack of it in our lives. A person’s attitude (love or lack of) will come out in actions. There are scriptures that help call us into accountability ~ Hebrews 12:14, Colossians 3:5, Proverbs 6:16-17. Psalm 106 is a must read to see the illustration of what it cost Moses due to a provoked spirit. Unforgiveness will become a root of bitterness but there are scriptures that will help us understand the importance of forgiveness ~ Colossians 3:13, Luke 17:3-4, Matthew 6:6-15. And many more characteristics are shared with verses to help us get grounded and you can find a list in the teaching handouts.